My mother died 23 years ago. She was sixty. To be honest it was a devastating loss. We lost our father two years earlier through a long battle with cancer but Mam? Well she simply disappeared one night, or at least that’s how it felt. She had come through a brief enough medical battle which in itself was life threatening. She was on the way back out of that battle all seemed well. Mam went out with her sisters for the first time since her battle began as if to celebrate her return. She dropped dead holding on to her sister’s hand, singing. Today is her birthday. She would be eighty three. I saw her two days before she died and I never saw her again. I was called to the hospital at two in the morning, but the body that lay on that hospital bed wasn’t Mam. She was gone and it truly broke my heart. Some people have a big influence on your life, some fade in and out without registering a mark. My mother’s love, left an indelible softness in my heart that has shaped all that may be good about me. When I wrote Little Big Boy, it was Mam that sculpted my tale. Many think the book autobiographical which of course it is not, but there are elements and stories from my life that I called upon, to evoke the emotion needed to make this book something special for me. At the heart of the book is Little Big Boy’s love for his mother and her love for him. It was my mother that I called upon when I needed to find the words to portray the deepest joy and sorrow and as such Little Big Boy was actually a very painful book to write. People say things like they poured their heart and soul into something. I did something quite different with what has become my readers’ favourite Max Power book. I gave of my pain. I shared a hurt I could never fully describe and I offered a taste of what love means to me. It was neither my heart nor my soul; it was the space in the break of my heart, the gap that had been forged through loss, an unfulfilled lonely pain that no one but you can know in your own terrible darkness when you lose someone you love. Little Big boy is not my story yet it carries the weight of my pain and the lightness of my joy. Perhaps that is why it is so special to me and why so many readers connect with it. I lost my brother seven years ago. Where once we were six now we are three and in writing Little Big Boy, I came close to following Dad, Mam and Brian through my own dice with death which is well documented in my blogs of the time. I miss them all, but today is her birthday so today I think of Mam. I miss her every day in truth but in a very subjective way. I miss her by her absence, which may sound an obvious thing to say but I mean more than just the obvious in this. In her not being there I have no one to scold me, no one to tell me I’m being foolish or selfish or unkind. I miss her ability to read me like a book and offer direction even when I disagree with her. Her absence left me rudderless. My north star clouded over as I sailed in the dark alone and despairing, wondering if I could ever find my way without her guiding hand. To be brutally honest, it took me many years to recover the loss, far longer than I either realised or imagined. Now I am a changed man. Perhaps I am just a man. She is not there to take my hand and guide me as I cross new roads in life. I have to make choices without that critical eye watching me with love. There is no doubt I have found love in other places. My heart is filled with my true love’s blessings every day but that is something very different. Now my darling Jo holds my hand and we cross roads together she and I. Over time I have learned not to be afraid of life’s traffic. I have found my own way at last and I can cross most roads safely. But sometimes, I miss her standing at the door watching me as I look left and right. I want to look back to see her smiling at me and then giving me a stern look, telling me to look where I’m going, urging me to walk and not to run. Look, I’m a writer and one who particularly enjoys delving into the darker matter of the soul, so perhaps I spend more time considering such matters than most. I need to feel my readers fear, to understand what I have to do to make them believe that the slender, outside edge of a ghostly little finger, just softly slid down their spine as they turn to the next page. I’m not specifically talking about horror, in all my books, I still revel in delight when I know I’ve hit the mark and sent a chill down someone’s spine. One of my favourite spontaneous Halloween memories is from when my children were small. We were at a party and I found a torch. I switched off all the lights and sat in the dark with the torch under my chin and asked “who wants to hear a story.” The kids all gathered around in a circle on the floor and I proceeded to scare the living bejesus out of every one of them. You cannot begin to imagine the squeals. It was a combination of fear and delight and I look for that in my writing. On that occasion I could see the fear, fun and excitement in their eyes and even though I can’t see my reader when I write, I do my best to recall such interaction to bring the excitement to life on the page. I’ve always enjoyed story telling. When I was a small boy, (true story) my grandmother came to stay with us and as we lived in a small house, she ended up taking my bed. I had options but the most attractive one was to sleep alone in front of the fire downstairs in a sleeping bag. It was a camping fantasy and my imagination was quite capable of placing me in the Amazon surrounded by a menagerie of wild animals. Now I like the rest of the world have had nightmares and bad dreams but what happened that night, felt so real to me that it stuck with me. The fear I felt, the cold, bald terror makes me shiver just recalling it almost fifty years on. My sleeping bag was old and blue and the zipper was a nightmare. It caught at every tooth and had to be very carefully handled so it wouldn’t break completely. It took forever to move it a few inches up or down. As I recall I awoke in the early hours at a time my more recent shadow man seems to favour. I lay there watching the embers in the grate. It was almost completely dark save the very low glow from the fire, when I felt a cold breath on my neck. The thing that leaned close in the dark, was real and terrifying and it whispered my name in the night. I squeezed my eyes tight for a moment and when I opened them, the sleeping bag had been opened just a little at the top and the flap folded neatly back. It was then I saw him. He had form and no form and he faded into the corner before disappearing. I remember he had an accent, one I couldn’t place and I was genuinely terrified. Now I know you’ll think, yep he was dreaming. Think what you will, that was one of those moments that I believe was real. We all have them and despite what I have just said, I am still a denier when it comes to ghosts and ghouls and things that go bump in the night, and yet… I have an even stranger one for you. My maternal grandmother was religious and when I travelled abroad, she gave me a small collection of religious artefacts to carry and keep me safe. Most people go with the old St. Christopher medal as he is the patron saint of travellers, but not my Gran. She gave me a Miraculous Medal inside a little orange pouch as she was a big fan of the Holy Mother, a small piece of blessed palm that she got from her local church and a picture of Padre Pio. She was a big fan of the Padre. 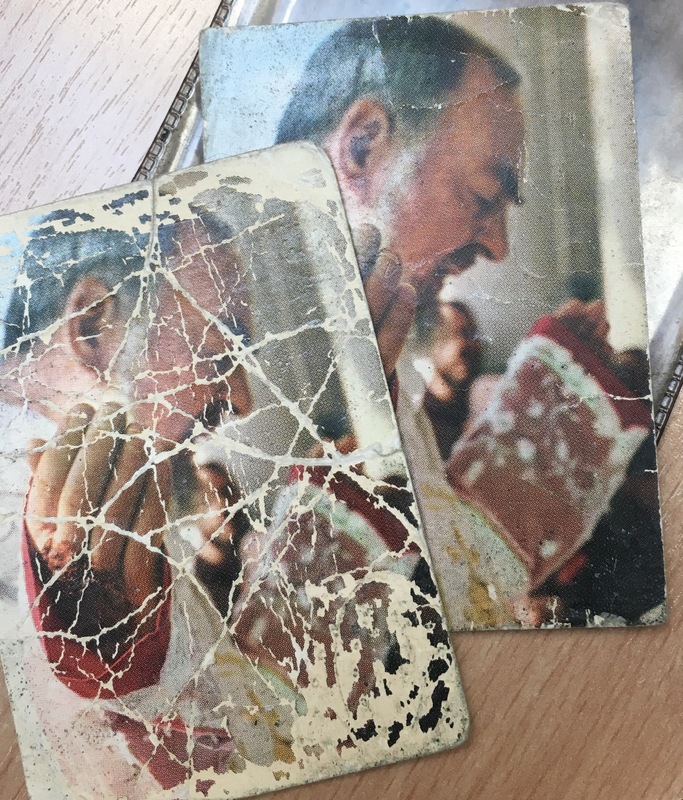 I took all three, unholy devil that I am, but out of love and respect for my Gran, I placed the Pardo Pio Pictures in a plastic sleeve and shoved it into the inner pocket of my wallet, tucked inside the little orange pouch. There they stayed until my mother died. Now here is the odd thing. No one knew I carried these things with me and after her death; I did something I hadn’t done in years. I tried to pray. It was an empty, foolish thing for a young man in my state of mind and it was a half-hearted hopeless gesture. My heart had been broken and I was so devastated that I would have turned anywhere for solace. I remembered the little medal my Gran had given me and thought I could pray to the mother of God to give me comfort. I had after all lost my own mother and my deeply engrained, early strong religious teaching, led me to it with ease. When I opened my wallet I pulled the little pouch and sleeve from the back pocket. They had been there so long, they were partially stuck but they came out without too much trouble. I put the sleeve to one side and I opened the pouch with the medal inside. Just as I expected, there was a medal with the form of the Blessed Virgin Mary, all dark and marked as I remembered it. This had been a well weathered, often handled possession of my grandmother after all. But then I saw the second medal. It was brand new and shiny as if it had just been made. I picked up the sleeve and shook it and the piece of palm fell into my hand. I reached inside and pulled out the little picture of Padre Pio. It was battle-scarred from being bent and frequently sat on, as I carried my wallet in my back pocket. As I held it, I rubbed my thumb across the little card and something even stranger happened. A second identical card slid from behind it. Only this one was immaculate. No crease marks and crinkles as it should have had like the other one. Now like I say, I am not religious and I am completely sceptical about all things that suggest spirits or ghosts, but the duplicate medal and picture were impossible to explain. I tried to create a logical explanation for this but I couldn’t. The religious gifts my gran gave to me were handed over one by one, a memory that is clear and unambiguous and I had handled each item multiple times before tucking them away in that little plastic pocket. No one could have known they were there and certainly would not have had access to my wallet, so it was unexplainable at the time and remains so today. A strange follow-on thing then happened. I placed the surplus medal in my car. I honestly don’t know why but it felt right. I have over the intervening years lost the medal three times and within a day, I have found another, in the most innocuous places. Despite my lack of religiosity, I still have one in my car and one in my wallet today. I guess we all have a story of the shadow on the stairs or the voice in the night and while I am the world’s biggest naysayer when it comes to everyone else, I can’t explain my own experiences so it leaves me with a dilemma of sorts. 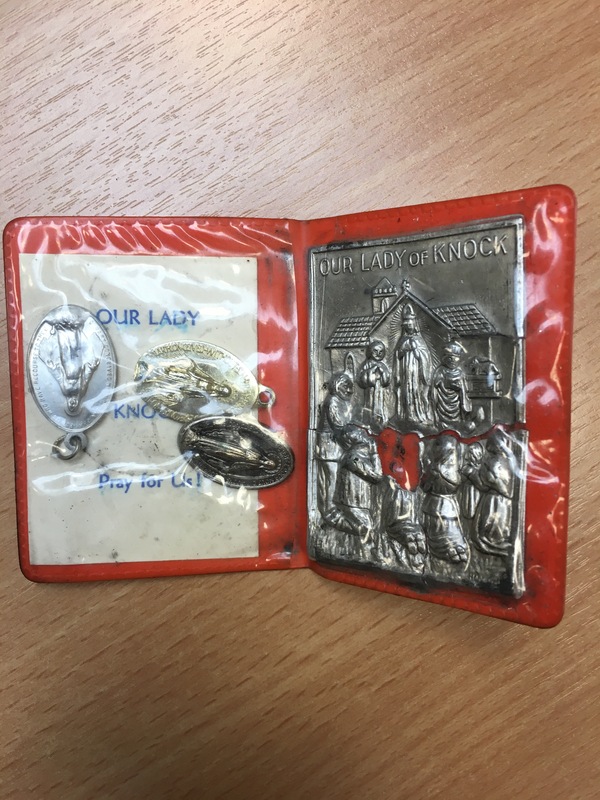 But here’s the thing… Remember I said I had a miraculous medal and then I found a second one which I leave in my car – the one I cannot lose?